Help Me Pass Constitutional Carry in Iowa in 2017! But Iowa Gun Owners Executive Director Aaron Dorr, a good friend of mine, tells me he hasn’t yet heard from you about renewing your membership in Iowa Gun Owners for 2017. If you’ve already sent in your 2017 renewal contribution, I sincerely apologize if our emails are crossing in the mail or online. But if you haven’t yet done so, will you please take a moment to fill out your Iowa Gun Owners’ 2017 Membership Renewal form and submit it to Iowa Gun Owners right away? The truth is, I believe this upcoming session of the Iowa General Assembly will be a critical one for Second Amendment supporters. With your help, I believe we have an absolutely incredible opportunity to make both Constitutional Carry and Stand-Your-Ground a reality in Iowa. But I can promise you these reforms won’t happen without your help. You’re a critical part of everything Iowa Gun Owners does. And I know you’re a big reason why we’re going to go into 2017 with a GOP Governor and BOTH houses of the Iowa General Assembly under pro-gun control for the first time since the 1990s! The truth is, for all the hoopla about what happened nationally, the results here in Iowa on Election Day were every bit as astounding. >>> Senate Majority Leader Mike Gronstal’s (D) shocking defeat in Senate District 8. In office since 1984, Senator Gronstal was the most powerful player in state politics and used that power to stop Constitutional Carry and Stand-Your-Ground from even being voted on in the State Senate. On election night, Senator Gronstal was defeated by a vote of 54%-46% by Republican challenger Dan Dawson who pledged 100% support for our gun rights. >>> Senate Judiciary Chairman Steve Sodders’ (D) defeat in Senate District 36. As one of Senator Gronstal’s top pals in the Senate, Senator Sodders used his position as Senate Judiciary Chairman to bottle up pro-gun reforms. He was defeated by 6% of the vote by GOP challenger Jeff Edler, who pledged 100% support for our gun rights. >>> Senator Brian Schoenjahn’s (D) crushing loss in District 32. Senator Schoenjahn was another giant thorn in our side — voting to maintain “gun free zones,” and kill Constitutional Carry and Stand- Your-Ground law. But as you know, victories at the ballot box mean nothing unless they translate into true pro-gun reforms. As a State Senator, I give you my word I will do everything I can to ensure my colleagues deliver on the promises they made to the voters on the campaign trail in 2016. 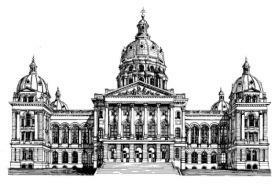 *** The Iowa Stand-Your-Ground Bill, which would simply state that law-abiding Iowa gun owners can defend themselves against attackers without fear of legal backlash from an anti-gun prosecutor or judge. Because we don’t have Stand-Your-Ground law on the books here in Iowa, Guns & Ammo Magazine says there are only 12 states in the country with worse gun laws than Iowa! *** Constitutional Carry, which would restore the right of Iowa citizens to carry a firearm to protect themselves and their families –- WITHOUT going through a bunch of bureaucratic rigmarole or paying expensive fees. In other words, if you’re legally allowed to own it, you’re legally allowed to carry it. PERIOD. In fact, just in the past two years, Constitutional Carry has passed in Kansas, Maine, Idaho, West Virginia, Mississippi and even in neighboring Missouri. So there’s no reason why legislators can’t pass it here — if you and I can turn up enough heat. The good news is, with your renewed membership, Iowa Gun Owners is prepared to keep the pressure on. So please, stand with us in 2017, by renewing your membership right now! Frankly, there’s no organization in Iowa who can claim to be better at forcing politicians to do the right thing –sometimes whether they want to or not. You see, Iowa Gun Owners doesn’t buddy up to legislators. They don’t care if they never get invited to fancy Des Moines cocktail parties. They don’t cut cozy backroom “deals,” and they don’t compromise. They’re concerned with one thing: The protection of our Second Amendment rights. But the truth is, every bit of Iowa Gun Owners’ effectiveness is because of generous folks like you who answer Aaron’s call to arms — and give so generously. >>> Paying for hard-hitting radio, newspaper and even TV ads to ensure politicians are feeling the most heat right before they’re forced to vote on Constitutional Carry and Stand-Your-Ground. This plan won’t be cheap. But it’s what it will take to light the fire under the General Assembly to get the job done. That’s why I was a little saddened to hear Aaron hadn’t yet heard from you regarding your renewed membership for 2017. So please, renew your support in Iowa Gun Owners right away! You see, you’re a critical part of Iowa Gun Owners’ winning team. It’s because of you that not one gun control bill has passed into law here in Iowa since IGO’s formation back in 2009. It’s because of you that all of the political “experts” here in Iowa are still as shocked as ever at the results we saw pour in on election night 2016. And I can’t bear to see you walk away now — not when I believe we could be on the precipice of some major victories for Second Amendment supporters. So won’t you please agree to a generous contribution of $125 to renew your membership in Iowa Gun Owners right away? Or if that’s too much, won’t you please agree to $75 or at least $35? Of course, whatever amount you choose to renew at is up to you. Just please be as generous as you can and renew your membership for 2017 right away. P.S. If you’ve already sent Iowa Gun Owners your Membership Renewal Contribution for 2017, thank you so much! Iowa Gun Owners members like you are KEY to protecting and advancing our Second Amendment rights here in Iowa. So please renew your membership with a generous contribution of $125, $75 or at least $35 today! Thank you, in advance, for standing with us in 2017!